Just before the coin toss for the big game on Sunday, February 1, Pizza Hut will debut two important firsts: its new 4forALL Pizza and Jessica Simpson's first national commercial. The commercial, created by New York-based BBDO, features superstars Jessica Simpson and The Muppets and the newest Pizza Hut product innovation: 4forALL Pizza -- the first pizza that solves the topping debate forever with four, individually topped, six-inch square pizzas in a single box for $11.99. Pizza Hut research found that families always debate about which toppings to order on a pizza because everyone wants something different. Although pizza is the ultimate food for sharing, coming to a consensus on the toppings can be the ultimate dilemma. Until now. The commercial features The Muppets in a heated debate about which pizza topping to order. For example, Kermit the Frog wants green toppings, Animal wants meat and Miss Piggy is a vegetarian. 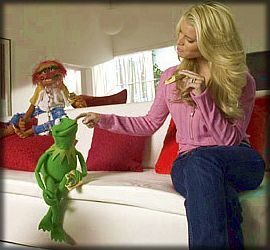 Jessica Simpson enters the scene and stuns The Muppets with the brainy answer, "Why not the 4forALL Pizza? It has more than 18 possible toppings... which gives you more than six million topping options," leaving them completely speechless. Awestruck by Simpson's ironic mathematic acumen, Miss Piggy pretends to have known this all along. The pizza arrives, Jessica reaches for a slice but Miss Piggy pulls the pizza box away from Jessica and says, "Beauty before brains." "The 4forALL Pizza is the perfect pizza to share as a family because everyone gets what they want. To emphasize the importance of this launch, we wanted personalities for the commercial that are recognizable, compelling and relevant to families," said Tom James, chief marketing officer, Pizza Hut. "Jessica Simpson and The Muppets are the perfect combination of classic and contemporary personalities. They show how 4forALL brings harmony to the dinner table by giving everyone what they want." "We are excited to work with Pizza Hut on introducing the new 4forALL Pizza," said Michael Polis, Senior Vice President of Marketing Worldwide. "The ad campaign with Jessica Simpson continues the Muppet tradition of fun and mayhem while featuring a new product that is perfect for every family -- even one with pigs, bears and chickens." Seconds before kick-off, Americans will see how the 4forALL Pizza provides a new solution to ordering America's favorite food. Each of the four pizzas is sliced into four pieces, for a total of 16 slices. The not-too-thin, not-too-thick 4forALL Pizza crust comes with a choice of up to three individual toppings or specialty pizza toppings, including Meat Lover's, Veggie Lover's, Cheese Lover's Plus or Supreme on each of the four pizzas. With nearly more than six million possible combinations, the 4forALL Pizza can make everyone in the family happy. Advertising featuring the 4forALL Pizza begins airing nationally Monday, January 26. On Sunday, February 1, two new spots will air -- one spot features The Muppets and one features Jessica Simpson with The Muppets. This is Pizza Hut's eighth consecutive year in the coveted pre-kick pod. In addition, Pizza Hut will sponsor the CBS pre-game show airing from 3:00 - 4:00 p.m. Eastern. Pizza Hut is supporting the 4forALL Pizza national introduction with a $50 million marketing plan including national print and broadcast advertising, point-of-purchase, high impact online ads placed on the top 10 Web sites visited by moms, as well as a targeted Hispanic media campaign. "The Sunday of the big game is one of the most-watched television events for families and friends, and it's the biggest Sunday of the year for Pizza Hut," said James. "It makes sense for us to advertise our new 4forALL Pizza in the pre-game hours when hungry football fans are deciding what pizza to order."